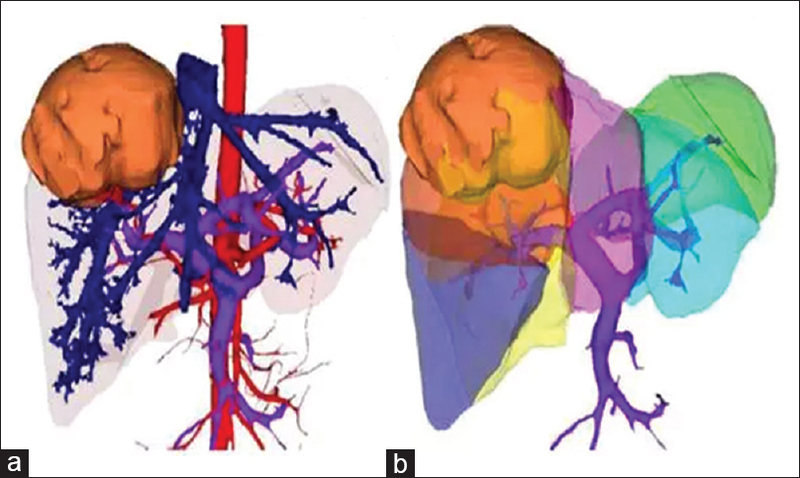 Three-dimensional (3D) visualization technology is a tool used to display, describe, and explain the 3D anatomical and morphological features of tissues and organs, which has been widely used in liver surgery. Indocyanine green (ICG) molecular fluorescence imaging technique has been widely used as an auxiliary tool at cell function level in the diagnosis and surgical navigation of liver tumors. Computer-assisted ICG molecular fluorescence imaging technique can guide the diagnosis and surgical navigation of liver tumors from the perspective of 3D morphological anatomy and cell function of liver tissues, which has been proved by the clinical application to possess unique and accurate diagnosis and treatment value. This consensus provides recommendations for the hot issues of the application of the technique in liver tumors, hoping to provide certain guidance and reference value for surgeons engaging in, or aspiring to engage in the diagnosis and treatment model. 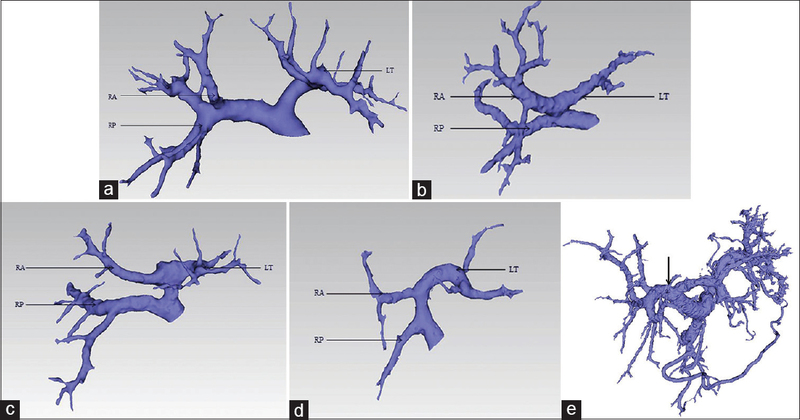 The three-dimensional (3D) visualization technology in hepatolithiasis could offer decision-making support to preoperative diagnosis, individualized surgical planning, and choosing operative approach. 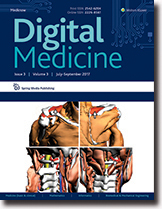 To standardize the application of 3D visualization and 3D printing technology in the precise diagnosis and treatment of hepatolithiasis, Chinese experts in relevant fields were organized by the Chinese Society of Digital Medicine and Chinese Research Hospital Association of Digital Surgery Committee to formulate this expert consensus. Background and Objectives: This study describes a software application for controlling a focused ultrasound system that was guided by magnetic resonance imaging (MRI). 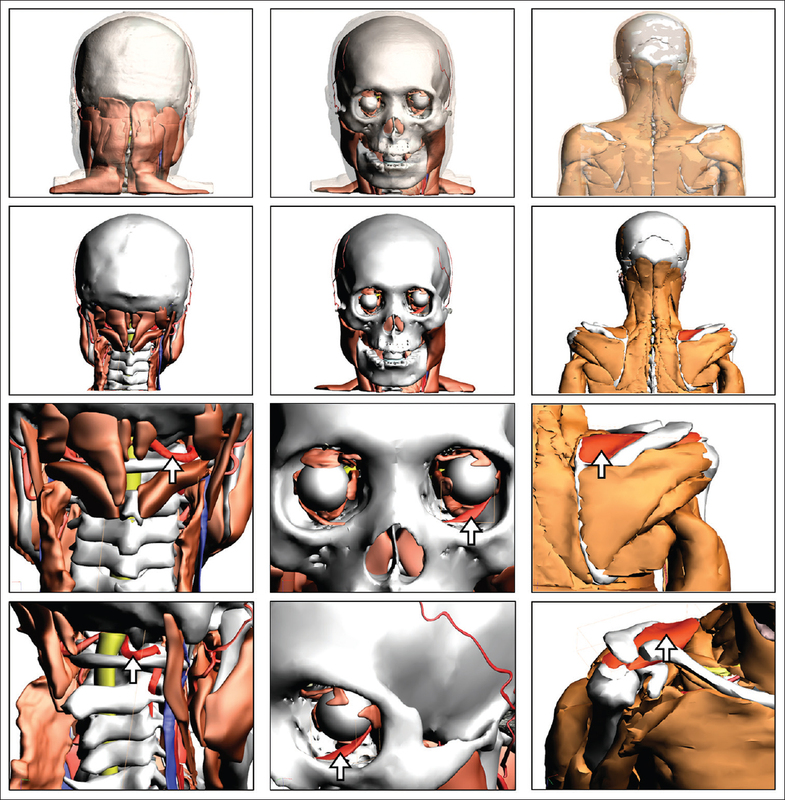 Materials and Methods: The software's functionalities were tested using a custom-made electronic system, MRI compatible robotic systems, and a high-intensity focused ultrasound (HIFU) system. The experiments were conducted in gel phantoms to test the motion accuracy and functionality of the system. Results: The software includes the following functionalities: (a) patient database (patient identification number, age, weight, gender, etc. 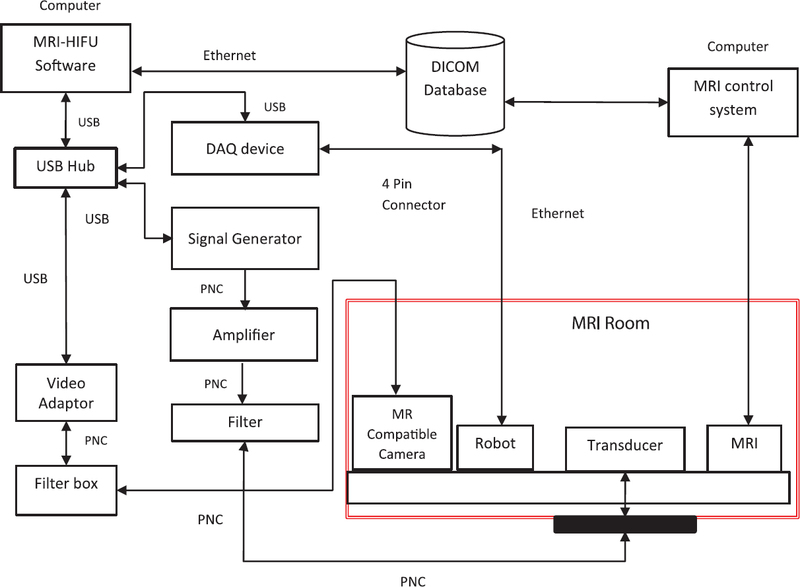 ); (b) acquisition of MRI images; (c) transducer movement; (d) transducer coordinates; (e) ultrasound control; (f) MRI thermometry; (h) temperature measurement with thermocouple; (i) command history (command name, starting time, and remaining time); and (j) MRI compatible camera. Evaluation experiments were conducted to test the software for accuracy, functionality, and communication with MRI. Conclusions: User-friendly software was developed to control an MRI-guided HIFU system. The software was evaluated in phantom experiments and it was found to accomplish all the intended functions. 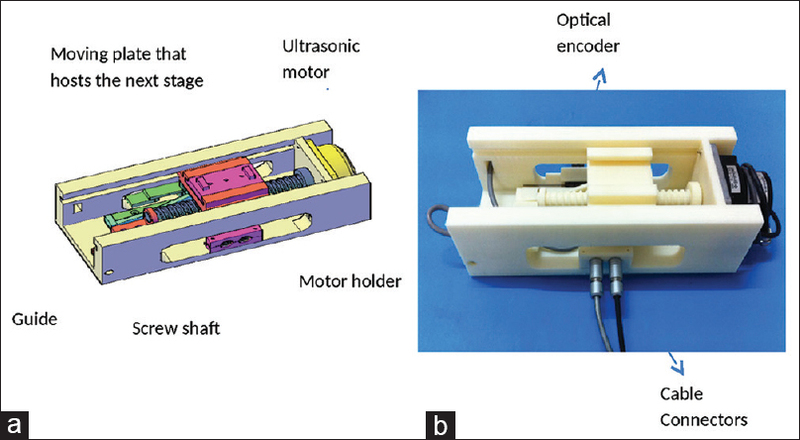 Background and Objectives: An magnetic resonance imaging (MRI)-guided focused ultrasound (MRgFUS) positioning device was developed with 3 identical Cartesian stages. The robotic system can be utilized to move a focused ultrasound transducer for performing various MR-guided applications. Materials and Methods: A single element spherically focused transducer of 4 cm diameter, focusing at 10 cm, and operating at 1.14 MHz was used during the evaluation of the robotic system. The propagation of ultrasound was either lateral or superior to inferior. MRI thermometry algorithms were developed to assess the thermal effects of MRgFUS. The proposed robotic system was developed using a three-dimensional printer. Results: The system was tested successfully in a gel phantom for various tasks (robot motion, functionality, and MR compatibility). Controlled thermal lesions were created in the gel phantom. The lesion creation was monitored successfully using MRI thermometry. Conclusions: The system was tested successfully for its functionality and its MR compatibility. This system has the potential to be used for focused ultrasound applications in the brain, breast, abdominal, and thyroid. 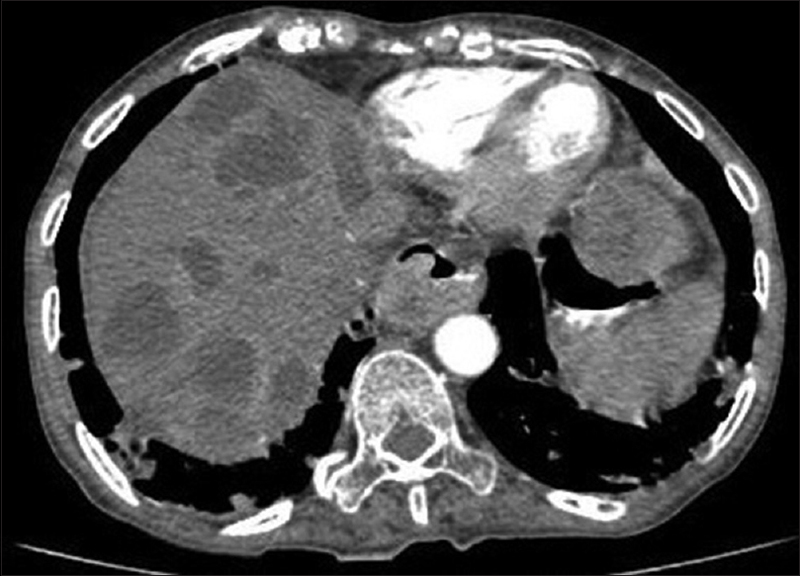 Esophageal cancer with liver metastasis is rare and when diagnosed is usually advanced and surgical management is contraindicated. The most common sites of distant hematogenous metastases in esophageal cancer cases are the liver, lungs, and bones. Here, we present a rare case of esophageal carcinoma presenting with cystic metastases to the liver.